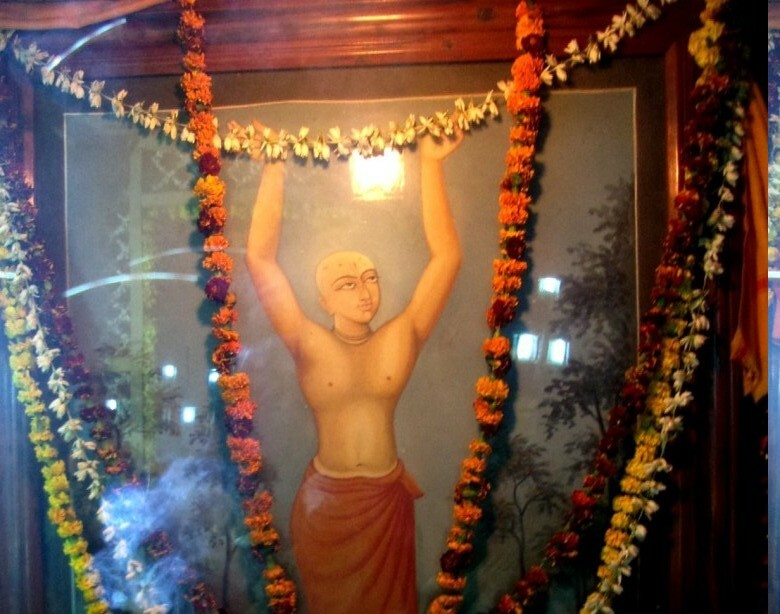 Mahaprabhu's portrait is taken on sankirtan around Vrindavan.Mahaprabhu's portrait is taken on sankirtan around Vrindavan. Of the many celebrations of the 500th anniversary of Shri Chaitanya’s Mahaprabhu’s advent in Brij-Vrindavan, the one being organized by the Amiya Nimai temple in Gopinath Bazaar. Amiya Nimai is the most important temple dedicated to Chaitanya Mahaprabhu in Vrindavan and the scene of annual celebrations commemorating Mahaprabhu’s 1515 visit every Karttik Purnima. This year, under the leadership of Vaishnavacharya Padmanabh Goswami of the Radharaman temple, festivities this year will be much expanded, bringing together many prominent persons from various walks of life. It will be held from the 18th to 25th November. The President of India, Hon’ble Shri Pranab Mukherjee, will inaugurate the celebration on the 18th November. Various dignitaries will also grace the occasion by their presence and the lineup will include Shri Ram Naik, the Governor of Uttar Pradesh, Shri Akhilesh Yadav, Chief Minister of UP and Smt Hema Malini, MP for the Mathura constituency. On the 18th November, at the request of Acharya Shri Padmanabh Goswami, Acharya Shri Padma Lochan Goswami, Acharya Shri Anurag Goswami, the President of India and Guests of Honor will visit the Shri Radha Ramanji Temple and the Amiya Nimai Mahaprabhu Temple. They will then attend a stage program at the Parmeshwari Devi Dhanuka Saraswati Vidya Mandir. 21 Nov. 6.30 p.m. Installing the auspicious vessel, performance of the adhivasa kirtan, by followers of Ramdas Babaji of Path Bari, Barah Nagar, Kolkata, W.B. 22 Nov. 5-6 p.m. Bhaktamal discourse by Bhaktimali Ji. 23 Nov. 4.30 p.m. Mahanta Sri Sachidananda Shastri, lecture. 23 Nov. 5.30 p.m. Tridandi Swami Bhaktivedanta Madhusudan Maharaj, lecture. 24 Nov. 9.00 a.m. Akrura-lila kirtan, by followers of Ramdas Babaji of Path Bari. Followed by bhoga offering and Vaishnava seva. 24 Nov. 5.00 p.m. Mahanta Premdas Shastri, lecture. 25 Nov. 9.00 a.m. Sri Harigopal Goswami (Kolkata) will read from Chaitanya Charitamrita the section on Mahaprabhu’s arrival in Vrindavan. 25 Nov. 3.30 p.m. Nagar sankirtan. Followed by bhoga offering and prasad. 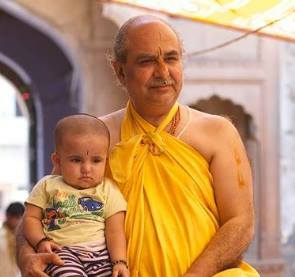 Vaishnavacharya Padmanabh Goswami, Sevait of Radharaman and Amiya Nimai temple. The celebration will culminate in a grand procession on the 25th November, Kartika Purnima at 3.30 p.m. from Shri Amiya Nimai Gauranga Mahaprabhu Temple. On this full moon day of the Kartika month, a kirtana procession goes out to the places in Vrindavan that Mahaprabhu visited on the day he first arrived. During this procession, various kirtanas are performed that describe what Mahaprabhu felt when He saw the various pastime places of Shri Shri Radha Krishna. On the day of Maha-raas Leela i.e. 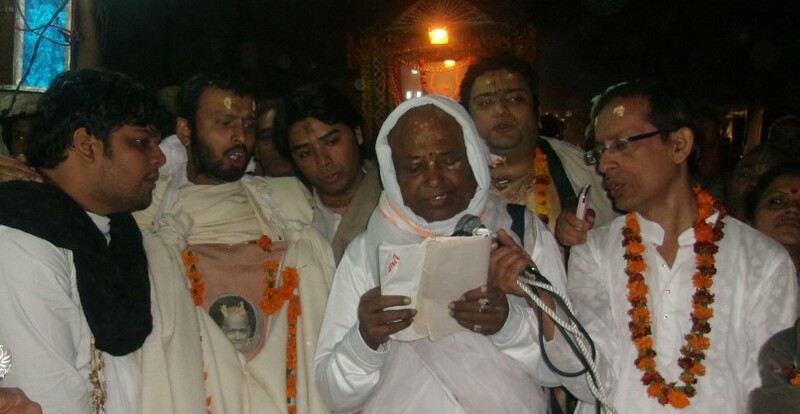 Kartik Purnima, Shri Chaitanya Mahaprabhu came to Vrindavan for the very first time. During His visit, he came to places where Radha and Krishna conducted their pastimes by doing the internal Parikrama of Vrindavan. 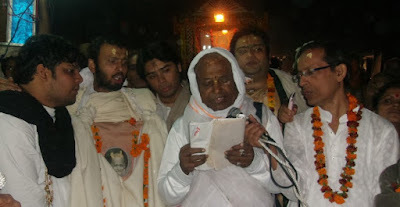 Every Kartik Purnima for the past 100 years, thousands of Gaudiya devotees and aspirants follow those footsteps of Mahaprabhu by going to those same sacred places, entering the mood of Vrindavan just as he himself taught his followers. The procession starts off from the Amiya Nimai Mahaprabhu temple (also known as Boro Gaur or Big Gaur) in Gopinath Bazaar at 16:00, and continue through the streets of Vrindavan until 12:00 am, singing the kirtans of those lilas that signify the feelings Mahaprabhu developed as he went to each place, the moods he was in when he saw the places of Shri Radha Krishna’s pastimes. On this particular day, none of the main seven temples or any other temple closes until this procession reaches them. Birbhadra Das Babaji Maharaj of Barahnagar Path Bari leading kirtan in Vrindavan on Karttik Purniima, 2013.